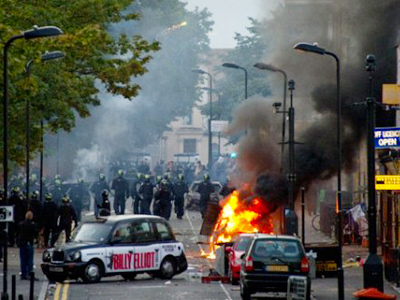 London police have managed to take the city under control and have prevented a fourth night of anarchy, but the lawlessness virus has infected some of England’s major centers, driving youths on to the streets to crash, burn and loot. Three young Muslim men have been killed in Birmingham early on Wednesday. The men were protecting their community from marauding gangs when they got rammed by a carload of suspected looters. Police have arrested a 32-year-old man who is being questioned on suspicion of murder following the deaths.The deaths come a day after a 26-year-old was shot to death while sitting in a car in London. British PM David Cameron has announced on Wednesday that Britain “will not allow a culture of fear” to be in charge on the streets, promising to take every action necessary to return order on the streets of Britain. 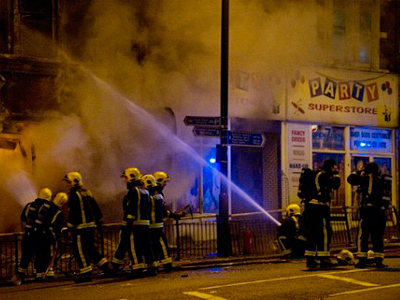 Cameron approved of police plans to use water cannons if necessary, saying the cannons will be available within 24 hours. “Phoney concerns about human rights” will not interfere in hunting the criminals down, the Prime Minister promised, recalling that the recent more robust approach to policing successfully resulted in much quieter night for the British capital. 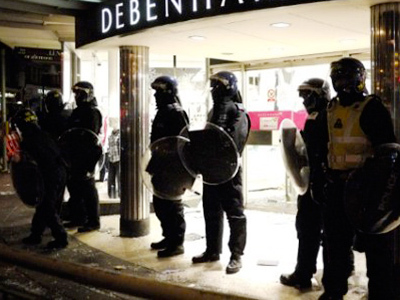 In the meantime British police suffer from a shortage of law enforcement to control the situation in all cities of the country where unrest erupts and pillage begins, leaving owners of small businesses no other choice but to self-organize to protect their property. 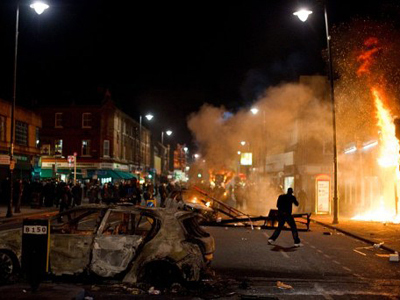 Last night public unrest and following looting of small shops have been registered in isolated parts of London, Birmingham, Gloucester, Liverpool, Manchester and their suburbs, with Manchester suffering its worst public unrest in 30 years. 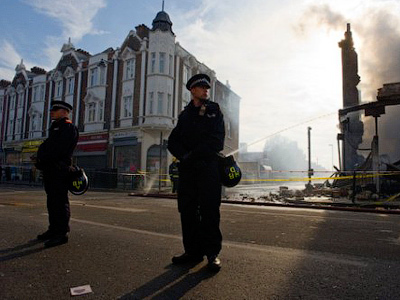 London overnight was remarkably calmer than the previous three, thanks to the police contingent increasing from 6,000 to 16,000 law enforcement personnel, but nevertheless some shops were broken into and police were kept busy, arresting 81 suspects – significantly fewer than the nights before. Police reported that this night street violence was limited to several suburban districts: Enfield, Canning Town and Eltham, with shop robbery attempts suppressed on Sloane Square. This time police used baton rounds never previously used by police on Britain's mainland. The anarchy flag fluttered high overnight in Manchester (108 arrests), Birmingham (109 arrests), Liverpool and its suburbs (50 arrests). 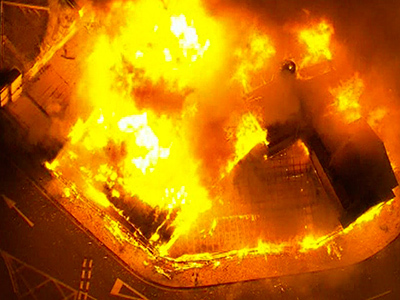 A car accident in Birmingham claimed the lives of three, with police not confirming that their deaths and the riots were connected. Sky News reports, though, that the deceased were volunteers standing against marauders and that they were run over by a looter’s speeding car. Law enforcement bodies warn that officers are living in police vans and are really exhausted. An officer’s shift can reach 20 hours a day. The unrest came highly unexpectedly for the British government that earlier announced plans to cut police spending by 20 per cent, while in less than a year London prepares to host the Summer Olympics. Protecting order during the Olympic will imply the biggest police operation in the UK for over a decade and the current situation shows British police are not so almighty at all. So far, 1,100 people have been arrested since the violence broke out on Saturday, 768 of them in London, of whom 167 have been charged – including an 11-year-old boy. Police say London's prison cells are overflowing. A man beaten by rioters in Ealing has died in hospital, reports The Telegraph, thus raising the number of victims from the violence to five. A total of 125 people, 111 of them police officers, have been wounded in the rioting. 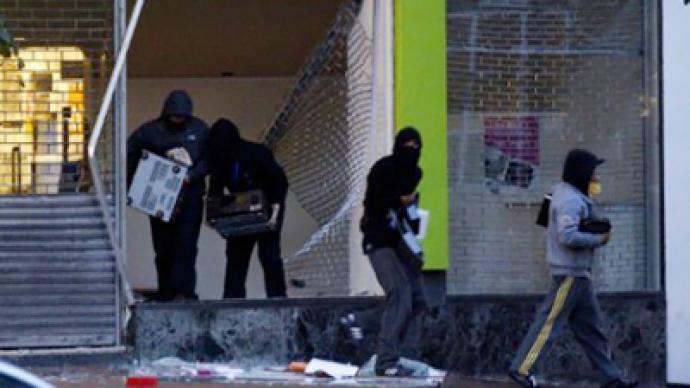 The vandalism, unrest and ensuing looting over the weekend in the UK were initially sparked by the death of a 29-year-old-man, who was shot by police on Thursday.